Written by Declan Gaffney and Ben Baumberg, authors of the new Touchstone Extra pamphlet “Dismantling the Barriers to Social Mobility“. 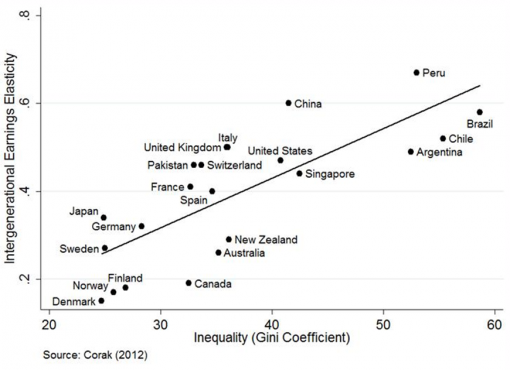 Why do some countries have more social mobility than others? The question is important, as it goes to the heart of the issue of equality of opportunity. In order to evaluate equality of opportunity in the UK, we need a point of comparison which gives a sense of how much mobility is achievable, and comparisons with other wealthy nations are the best place to start. By looking at factors associated with higher or lower mobility in similar countries, we can get a sense of where there is scope for improvement. In Dismantling the Barriers to Social Mobility, a new paper commissioned by the TUC, we review some of the latest evidence on these issues. First, some unavoidable definitions. 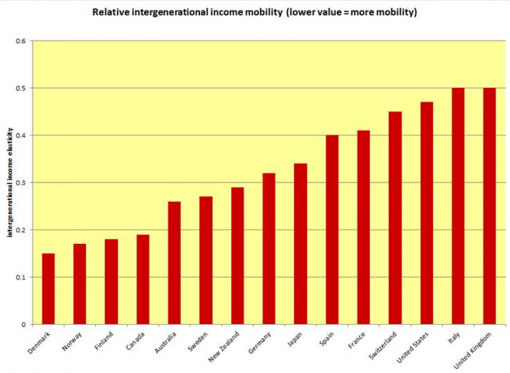 Social mobility is about the relationship between social origins and destinations, whether between different generations of families (intergenerational mobility) or across individual lifecourses (intragenerational mobility). How origins relate to destinations depends on the structure of opportunities in society- on the social structure or the income distribution. But it also depends on the ease with which people can move from one position to another. Changes in the overall structure of opportunities (e.g. ‘more room at the top’) are usually referred to as ‘absolute’ social mobility while the rate at which people change positions (e.g. ‘rags to riches’) is known as ‘relative’ social mobility. Mobility can be measured in terms of class or income – and the results can differ, because the relationship between class and income can vary over time or between countries. Finally, social mobility can of course be upwards or downwards – ‘riches to rags’ as well as ‘rags to riches’. What explains these differences between countries which are, after all, at similar stages of economic development? The economist Gary Solon (building on earlier work by the late Gary Becker and Nigel Tomes) published a model in 2002 which predicted that other things being equal, societies would tend to show less mobility the more unequal their distribution of income. This doesn’t mean that more inequality means less mobility in all cases: other factors are also important, and Solon laid particular emphasis on the equity of education systems. But as international evidence on mobility has built up over recent years, the predicted inequality/mobility relationship has been shown to fit the facts. Miles Corak’s ‘Great Gatsby Curve’ (below) showing inequality and mobility has become justly celebrated. Myth (number) one is that social mobility is simply a sub-set of income inequality. According to this myth, mobility will follow automatically in the wake of greater equality …the uncomfortable truth is that nations with similar levels of income inequality have dissimilar levels of social mobility. Why do Australia and Canada have UK levels of inequality, but almost Scandinavian levels of mobility? It is perfectly right to draw attention to Canada (and to a lesser extent Australia) as countries which have relatively high inequality and high mobility. Canada in particular shows mobility levels which are similar to those in Norway and Finland, which have much less income inequality. But it is not clear exactly who the Deputy Prime Minister is arguing against here. The example of Canada, far from undermining Gary Solon’s work, is further evidence in support of his theory. Solon’s model predicts that mobility will be higher, other things being equal, if the education system is of high quality (so that any additional spending on education by parents will have less of an impact) and if the system is more ‘progressive’, that is if it achieves better outcomes for disadvantaged children. 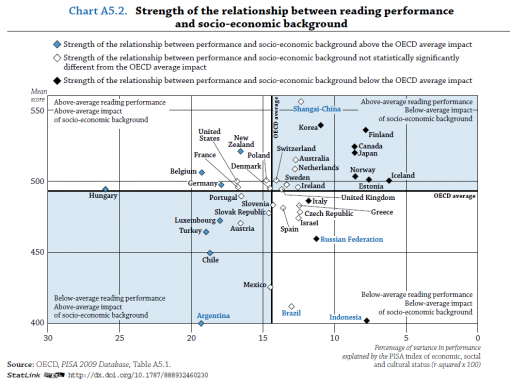 The implication is that countries can to some extent offset the effect of inequality on mobility through education. But Canada remains exceptional in terms of both the quality and the equity of its educational outcomes: it also has lower inequality than the UK or the United States. The education system in the UK would therefore probably need to achieve even better and even more equitable results than Canada’s to compensate for its higher levels of inequality. That is a tall order. In the paper, we identify a range of factors associated with mobility- whether the association is direct or through their effects on incomes or on educational outcomes. The effect of having a university degree on income is high in the UK, leading to greater inequality and (Solon’s model suggests) lower mobility. Child poverty is strongly associated with lower mobility- and it is worth noting that child poverty before redistribution through the tax and benefit system in the UK is extraordinarily high (40%) compared to most other wealthy European nations: this suggests that poverty-reducing redistribution cannot be ignored in trying to address social mobility. We also find an interesting relationship between women’s employment and mobility. Full-time employment for women is associated with higher mobility, but if women’s employment is concentrated in part-time jobs, the effect is the opposite. This is probably because there is less polarisation of employment between households in countries where women’s opportunities to work full-time are greater, leading to more equal distribution of income. This leads to a number of recommendations about where efforts to increase mobility should be concentrated, which are included in the paper. 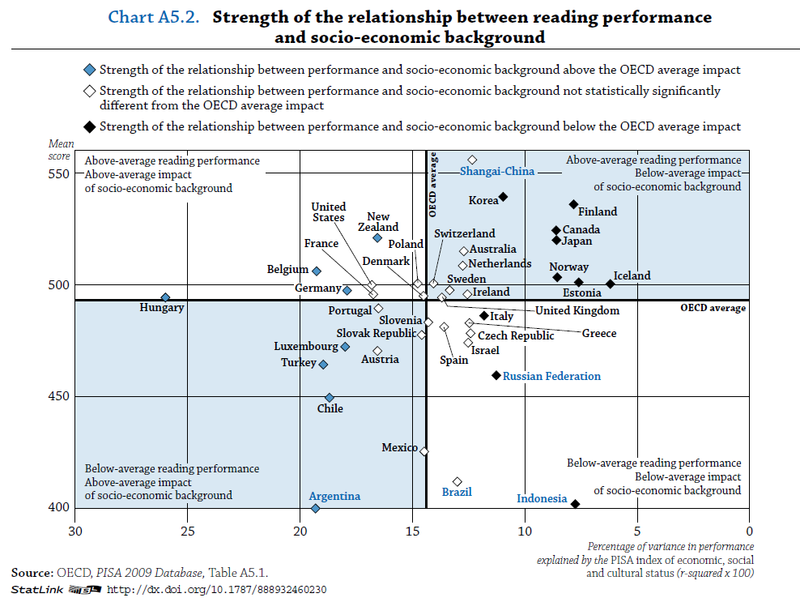 One broad conclusion from the review seems inescapable: the UK will not achieve levels of social mobility comparable to the best performing nations without both making major inroads on the drivers of economic inequality between families and improving the equity of educational outcomes. 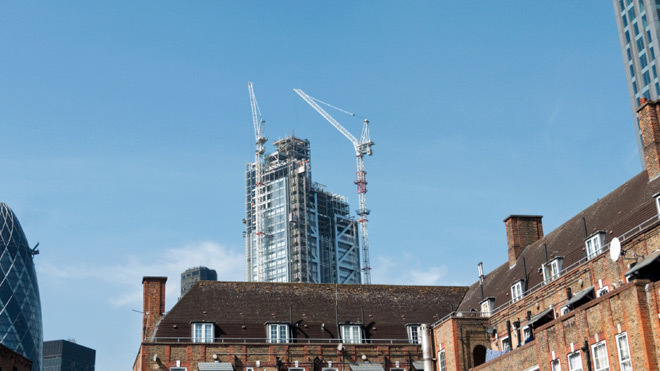 Declan Gaffney is the author, with Ben Baumberg, of the new Touchstone Extra pamphlet, Dismantling the Barriers to Social Mobility, to be launched tomorrow (13 May) at a seminar with Alan Milburn, Stephen Timms and Claire Tyler. Declan Gaffney is an independent policy consultant specialising in social security, employment and income distribution. Ben Baumberg is a Lecturer in Sociology and Social Policy at the University of Kent. He is co-founder of the collaborative research blog Inequalities.